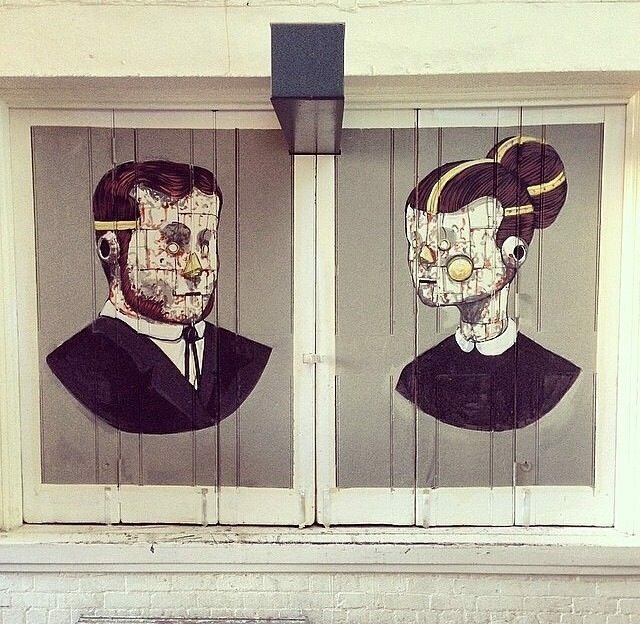 Longtime Vandalog contributor Gaia posted an intriguing photo today on Instagram. I’ll let these photos and Gaia’s caption speak for themselves, other than to say that this seems to be the great (largely) unwritten critique of JR within the street art world. Update (Feb 2, 2017): A few readers have reminded us of this incident from 2015 where an ad agency tried to “steal” JR’s artwork from Kibera to raise money for charity, but then things went a bit pear-shaped. 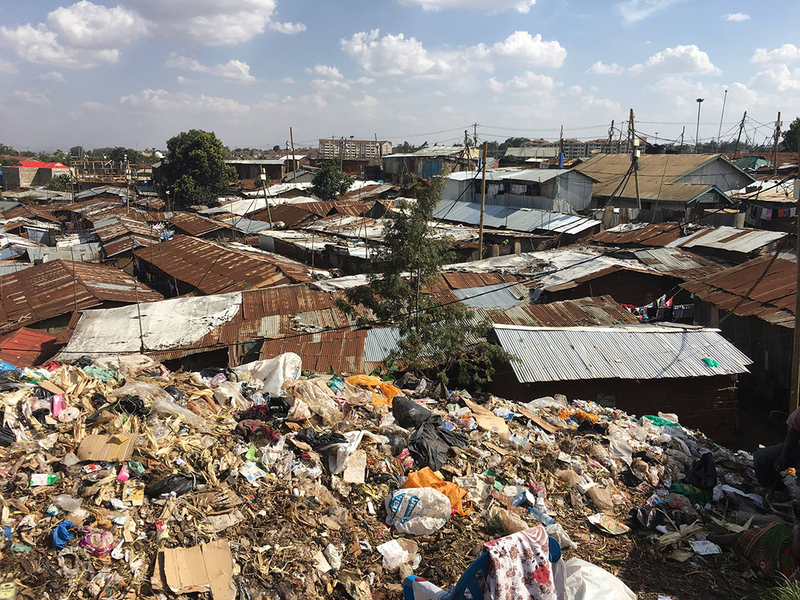 Kibera in 2017, with the remnants of JR’s work on visible. This week, Amazon launched the Amazon Street Art Project, which features new limited edition artwork from stikman, Faith47, AIKO, Gaia, Logan Hicks, Ganzeer, and Ron English. Each piece in the project is only an edition of 50, so be sure to have a look before they’re all sold out. Since I curated the series, I thought it would be good spend some time looking at what makes each piece in the collection special. stikman’s print based on a series from 2008 that he’s revamped to turn into his very first screenprint. 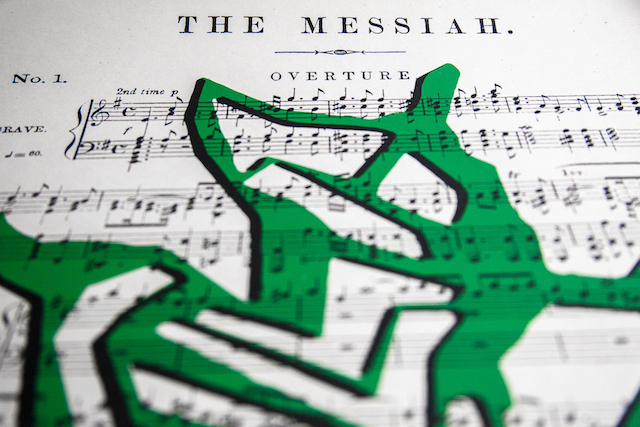 What I love about Overture is the illusion of 3 layers that stikman created out of the two black and green layers, simply by printing black layer (both the musical score and the stikman figure’s shadow) on top of the green layer. 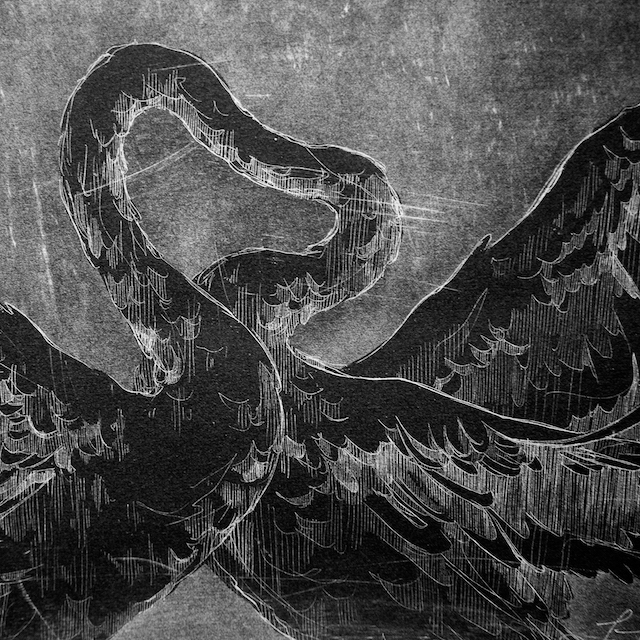 Faith47 really came up with something irresistible by printing silver ink on black paper for her etching, The Psychic Power of Animals. 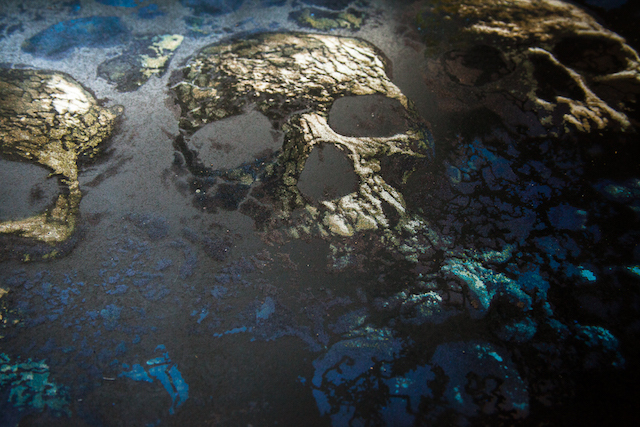 There’s also a must-see video of the etching being produced. With AIKO’s Bunny, we started with a straightforward concept: A print of Aiko’s classic Bunny icon. Then, AIKO decided to go overboard in the best way possible, adding layers and layers of hand-painted customization to every print. 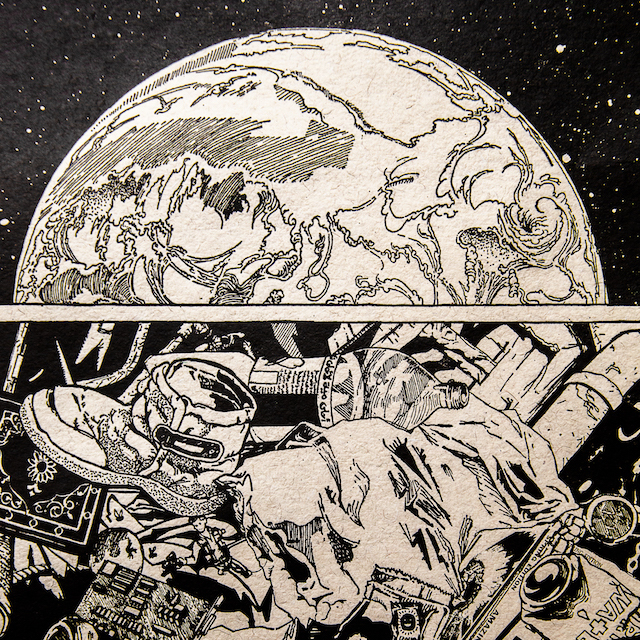 Gaia’s screenprint makes great use of half-tones, something I’ve often seen go poorly with other artists. 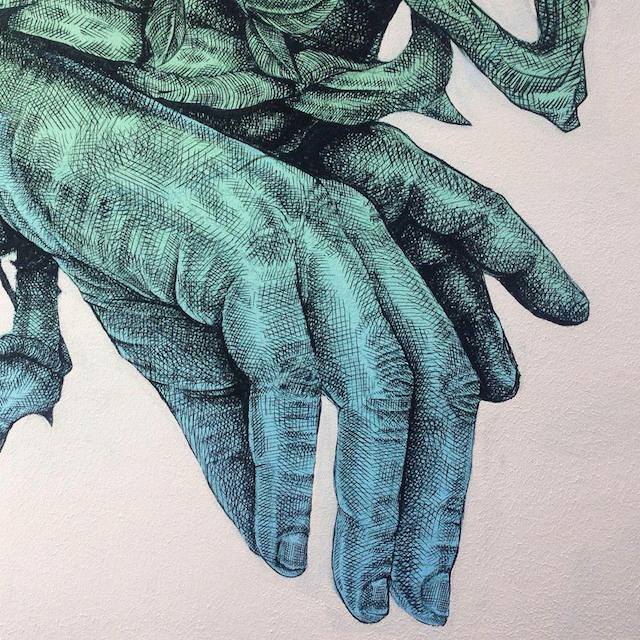 Usually, you see artists using half-tones to skimp on adding what should be another layer of color to their print, but Gaia uses them masterfully for Amani, adding essential detail and depth to his work. Logan Hicks’ Wasted Lives is the main reason I keep having to avoid calling this a print series. Wasted Lives is not a print. It’s a completely hand-painted edition. 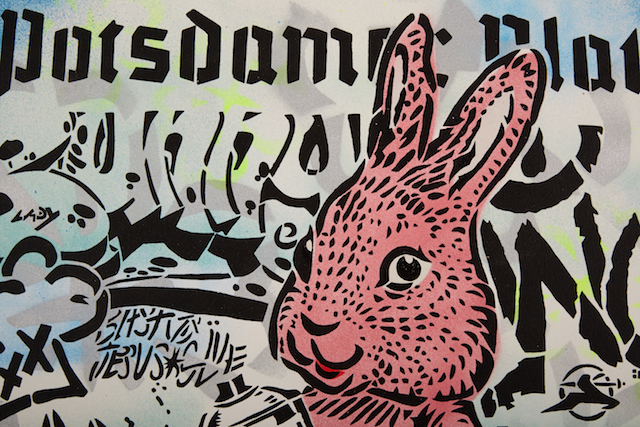 Using his pioneering stencil techniques, Hicks created an edition of 50 original works on paper. You really have to get in close to appreciate the full beauty of Ganzeer’s After the Starstuff. 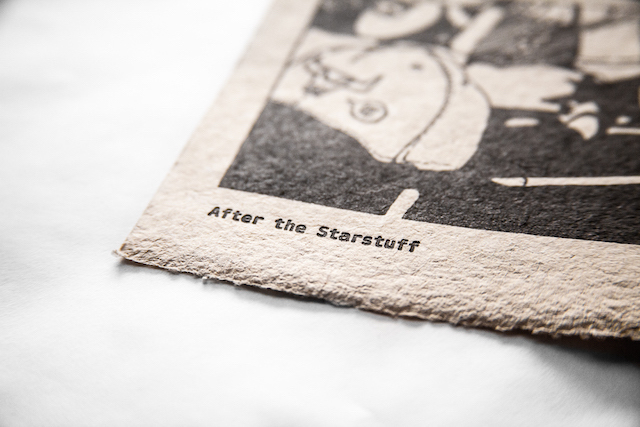 Yes, the image itself, of the Earth from space and then close-ups on a pile of man-made trash, is powerful, but Ganzeer took this to another level by making this a letterpress print and using handmade hemp paper. In December, an eclectic set of seven prints and editioned works from some of the world’s most interesting street artists will go for sale on… Amazon.com. Starting December 7th and available for one week only, Amazon.com will be offering new works by Ron English, stikman, Faith47, Gaia, AIKO, Logan Hicks, and Ganzeer. There are three screenprints, one etching, one letterpress, one done entirely with spraypaint and stencils, and one hand-finished giclée. Each artist’s piece is an edition of 50, and the prices range from $200-550. 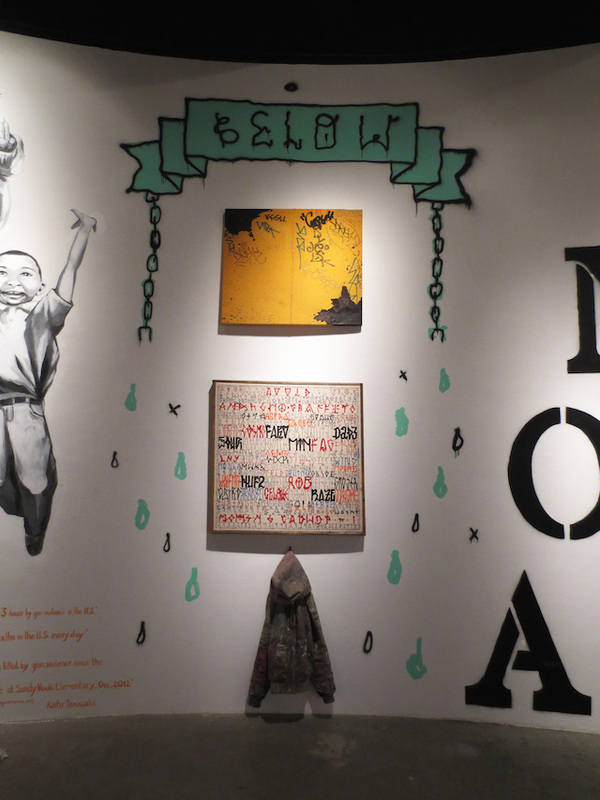 If a lot of the artists in the line up look familiar to regular readers of Vandalog, that’s because I curated the collection. This is the first time that Amazon has worked with a curator to arrange a series of new works specifically for them. When I was brought into the mix, the idea was pretty open-ended: A series of prints by seven street artists to be released in December. With that in mind, I wanted to capture a small slice of the variety that exists within street art, to show how street art resists being defined by a single style or medium. That’s how we wound up with a collection that ranges from Ganzeer’s subtly dark letterpress print to AIKO’s bold pop art utilizing screenprinting and spaypaint. 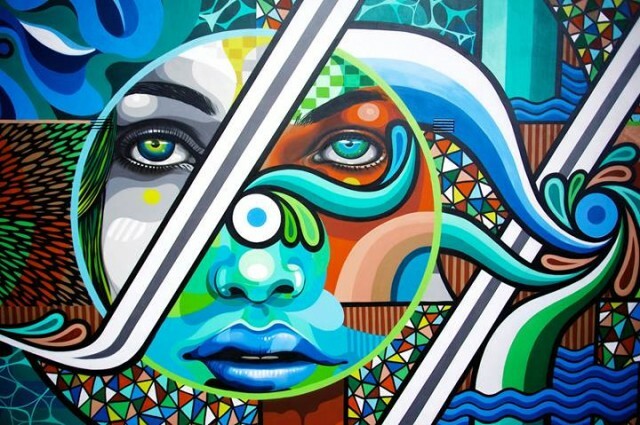 I think, and I hope you’ll agree, that we’ve put together a suite of seven extraordinary pieces by a broad sampling of some of street art’s finest. 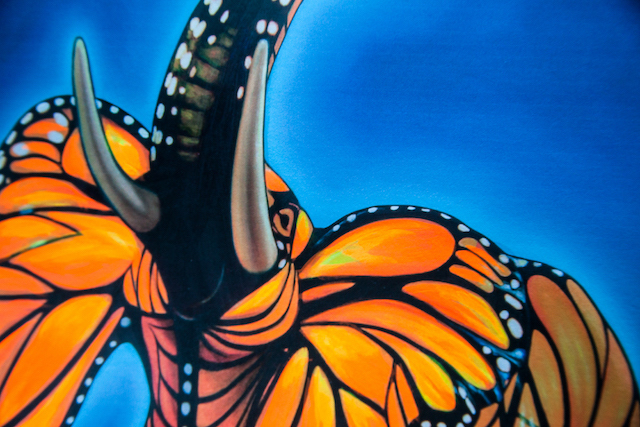 You can preview the entire Amazon Street Art Project on Amazon.com. The works will be available online starting December 7th. 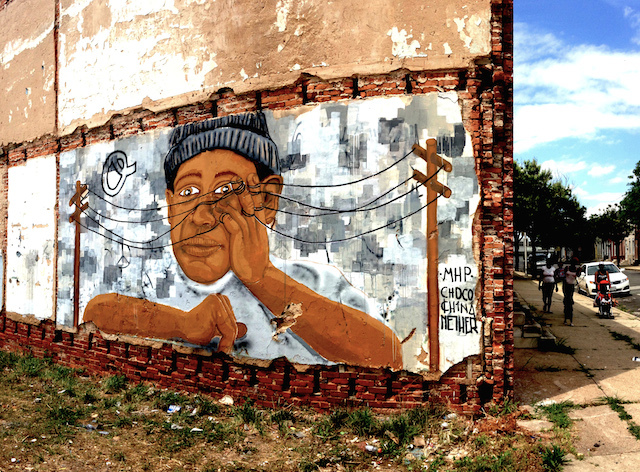 Has street art “sold out and gentrified our cities”? 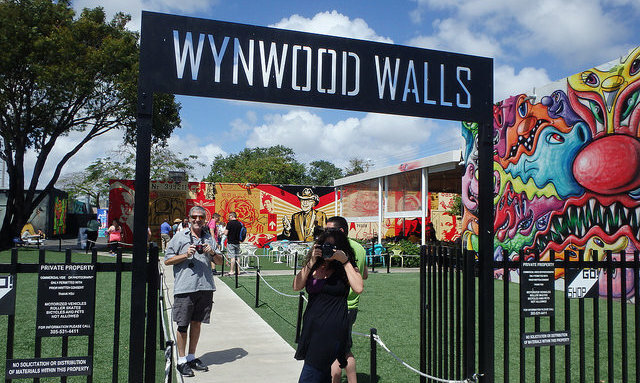 The entrance to Wynwood Walls in Miami, Florida. Photo by Osseous. 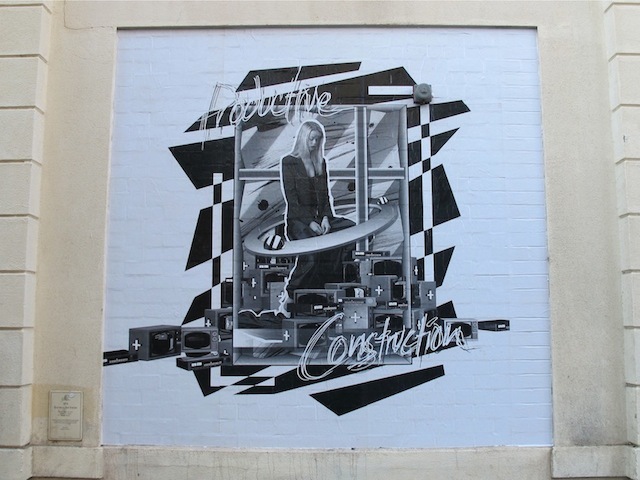 Earlier this week, the online street art community was abuzz about an article by Rafael Schacter for The Conversation, From dissident to decorative: why street art sold out and gentrified our cities. Between the time I left my apartment on Monday morning and when I arrived at work half an hour later, it seemed like a dozen of my friends had shared the article or reacted to it in some way. 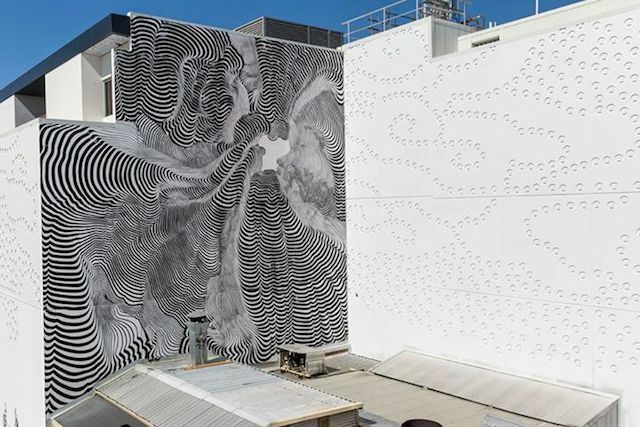 Schacter has captured a feeling about street art and contemporary muralism, a nagging fear really, that seems to have been bubbling just beneath the surface for a while now. 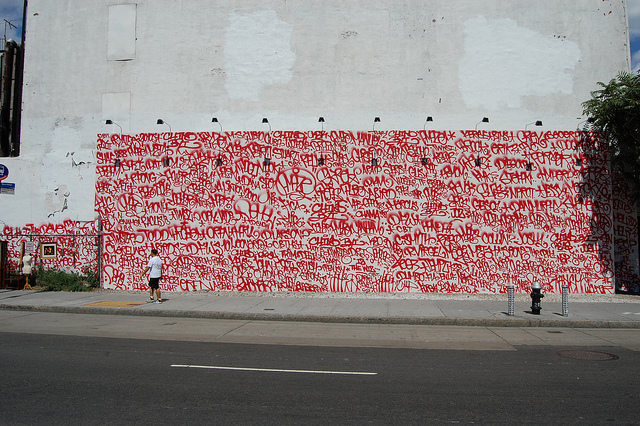 Basically, Schacter argues that street art isn’t rebellious anymore. Rather, that it’s most notable form is as a tool used by corporations to spur gentrification. Agree or disagree, the article is a must-read. What and where are open walls? Partially buffed Barry McGee mural at Bowery and Houston (the buff marks cover more red tags). Photo by Andrew Russeth. 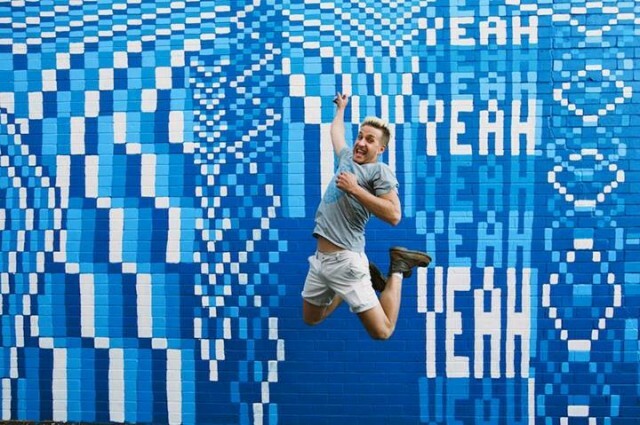 UPDATE: Xavi Ballaz (known for Difusor and the Open Walls Conference in Barcelona) has responded to this post with some of the more positive advancements towards open walls, and suggests that the open walls movement does indeed need a manifesto. A friend of mine recently used an interesting phrase: “the open walls movement.” I thought he was using the term as a synonym for “the street art festival circuit,” which upset me, because street art festivals do not have what I would call “open walls.” But really, my friend was commenting on a larger movement perceived to be spreading around the world to use public space differently (insomuch as walls on private property are public space). On the surface, he’s right. 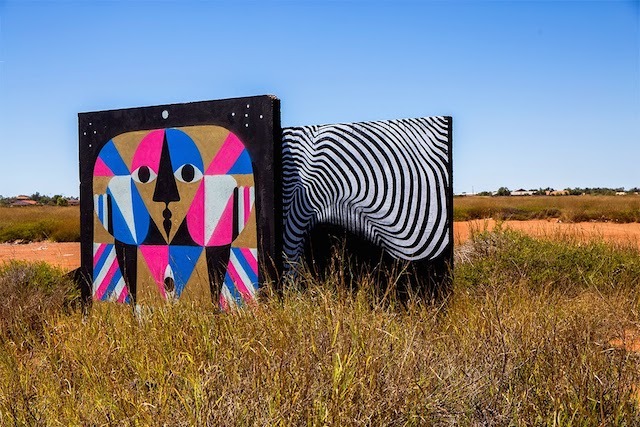 Street art festivals, grassroots muralism programs, free walls, curated alleyways and everything in between now exist in cities and small towns around the world. Does that make a movement? I don’t know. Nobody is getting together to write a manifesto and participants’ aims and methods are diverse, but there is a disparate group of what I’ll call “open walls people” who share a new way of looking at walls and public space: Public walls are for the artists, murals enliven streets and communities, and there should be limited or no government regulation of murals, but advertising in public space should be heavily regulated or eliminated entirely. 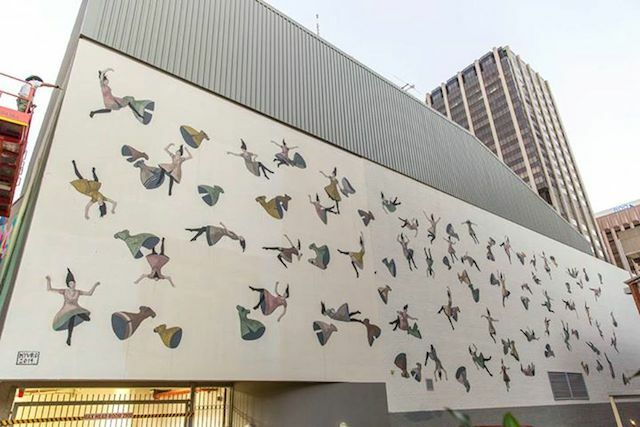 Simply put, “open walls people” believe in unrestricted art in (often odd) public spaces. 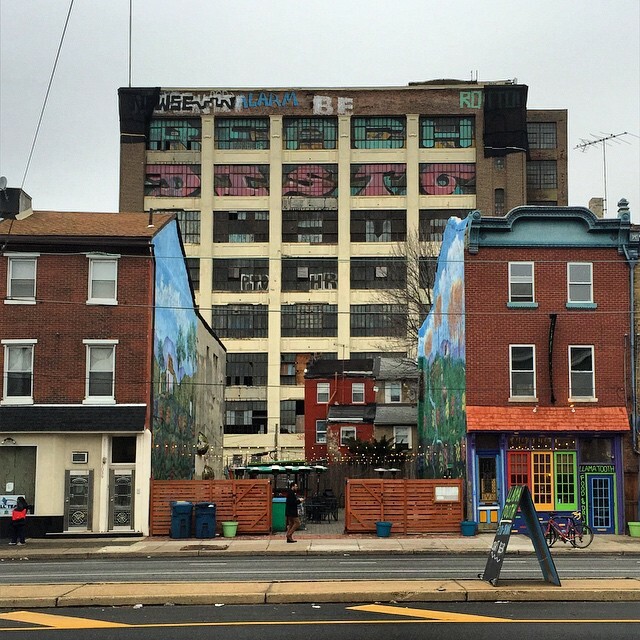 In Baltimore, where every water is uncharted, street art has navigated its own course. 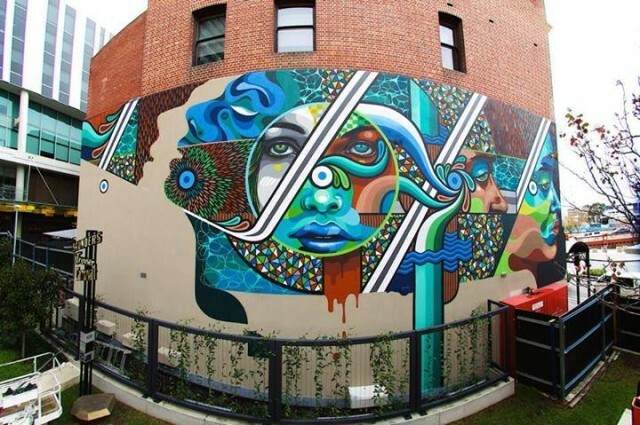 What began as a covert creative expression of artistic imagination by individual street artists has matured to become an important force that binds artists and neighborhoods. 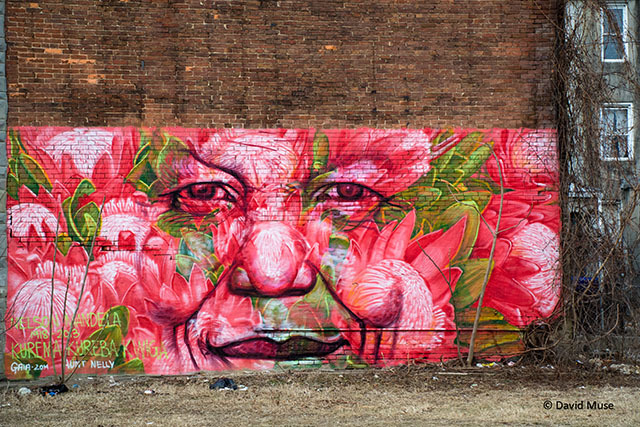 Baltimore’s growing legion of street artists has piloted a course of creating art on parched streets and using it to quench neighborhoods’ thirst for something beautiful and sometimes provocative in their midst. When I began wheatpasting, there were only three other street artists in town who regularly got their pieces up: Ways, Gaia, and Nanook. Mata Ruda began wheatpasting about the same time I did and we worked together often. Everyone used a fly-by-night installation approach, using the cover of darkness to get our work up. 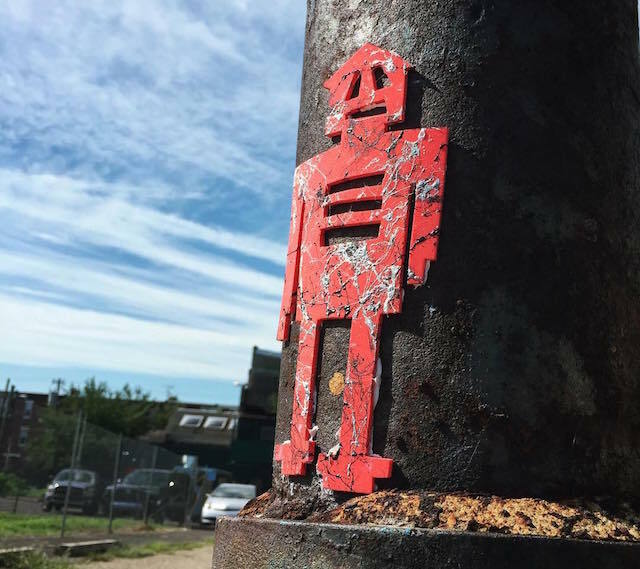 Unsanctioned street art was something relatively new to Baltimore and the public viewed it as a sort of furtive “where’s waldo” game. We used the element of surprise to start the conversations that our work desired. Gaia. Photo by David Muse. Everything changed in 2012. 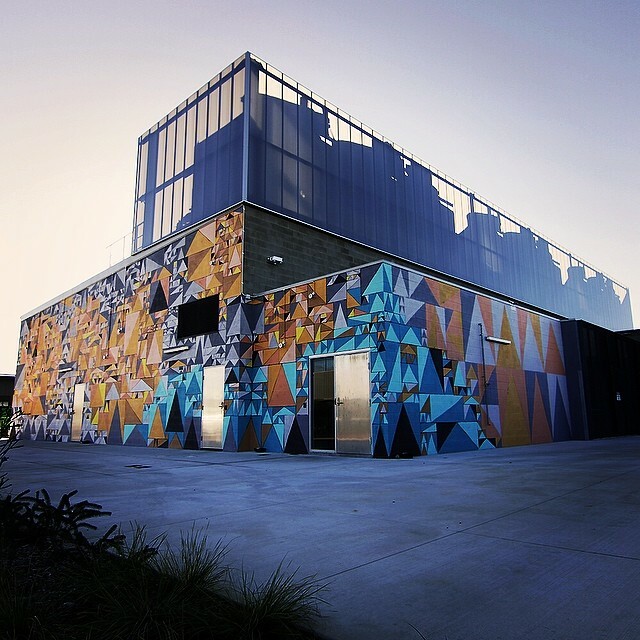 Under the direction of Gaia, Open Walls Baltimore began and with it the Station North neighborhood—Baltimore’s arts district—was transformed by the presence of spectacular, large murals funded by the National Endowment for the Arts and PNC Bank. 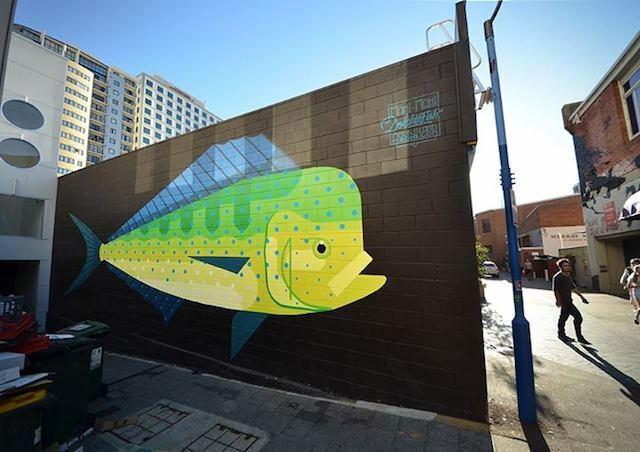 With the arrival of the street art mural circuit to a city new to street art, Baltimore discovered street art’s ability to change an urban landscape. 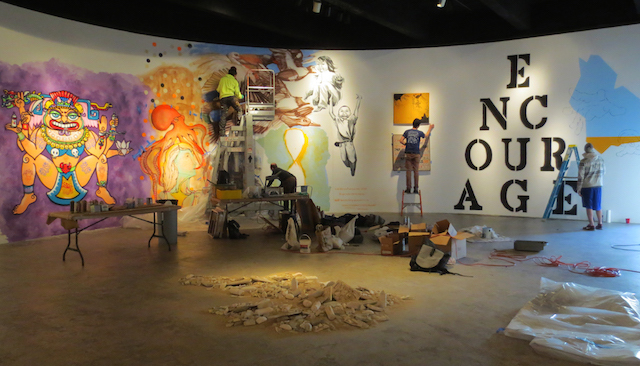 Most works didn’t deal with Baltimore politics and social issues directly but their presence acted to educate the public about the value of this new-to-it art form in giving voice to and beautifying our town. 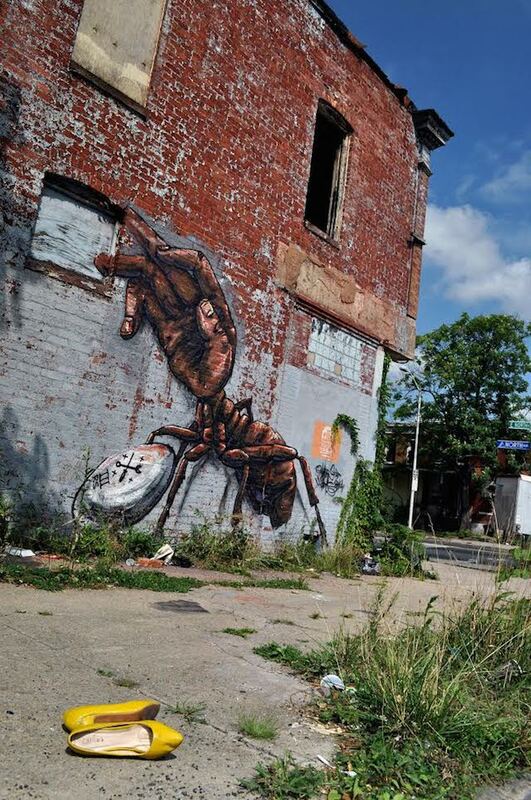 With Open Walls, Baltimore found a place on the map in the street art world. This place was solidified after the launch of Articulate by Stefan Ways in October 2012. Leaving a cold wet 17 degrees in Melbourne, I was pretty damn excited to fly to Perth on the 10th of April, right in time for the grand finale of PUBLIC by Form Gallery in Perth, Western Australia, which I posted a preview of a while ago. I arrived to a perfect sunny 30 degrees and soon as I hit the ground, I had a good feeling about Perth, I hadn’t been before, but something felt right. I went straight to the hotel and dropped off my bags, and went for an explore. 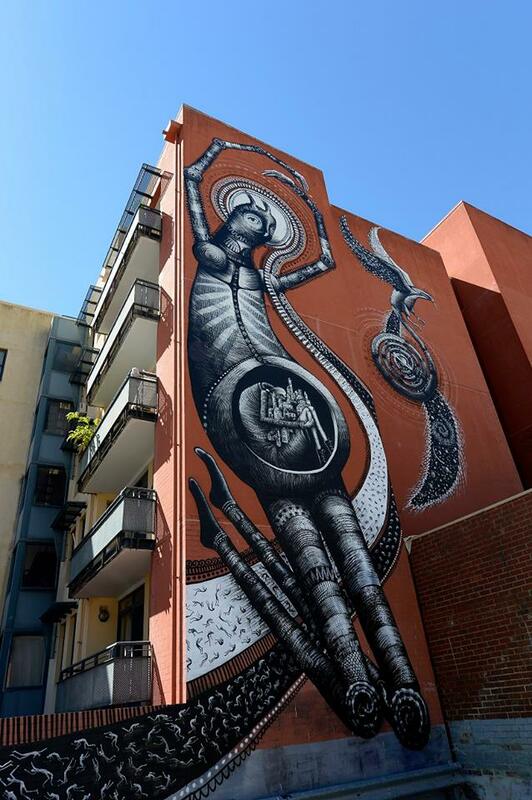 Within a few hundred metres of my hotel, I could see the amazing Phlegm and ROA murals in progress. I made a beeline straight for them. Upon entering the car park I also saw the work of many other great artists. 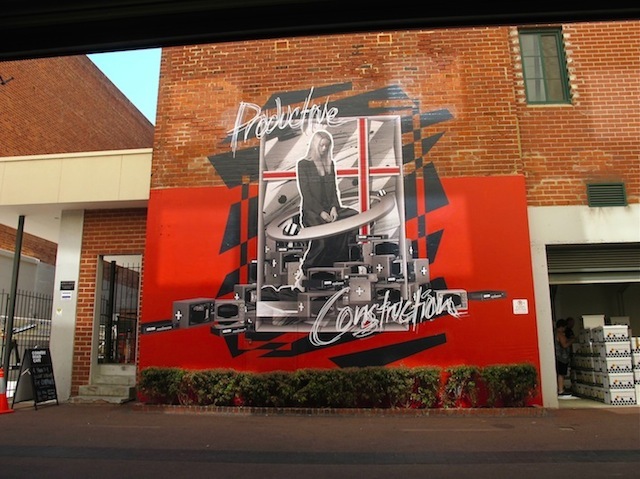 The works were spread throughout the CBD and inner city suburbs. Here’s a selection of some of my favourite pieces from the event. 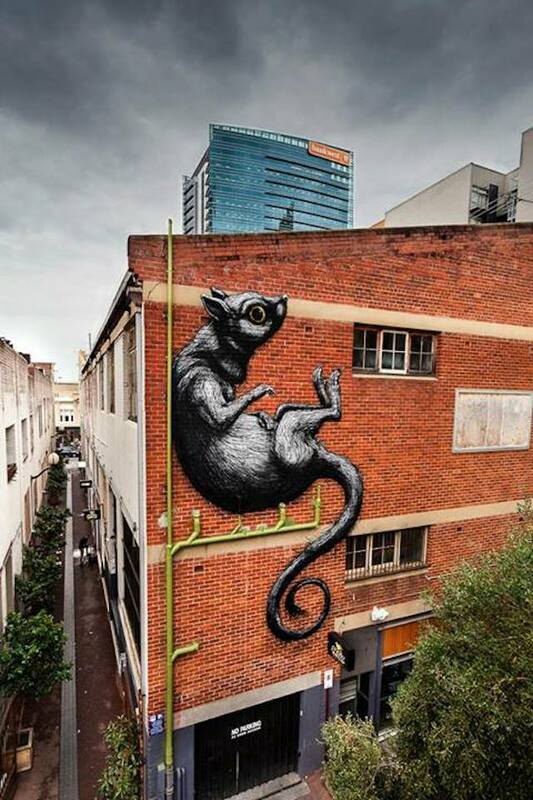 ROA. Photo by Bewley Shaylor. Pixel Pancho. Photo by Dean Sunshine. Pixel Pancho. 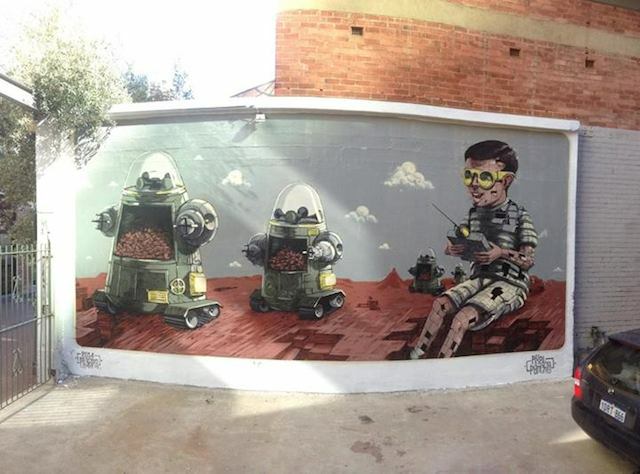 Photo by Pixel Pancho. Phibs. Photo by Luke Shirlaw. Hyuro. Photo by Luke Shirlaw. Phlegm. Photo by David Dare Parker. Alexis Diaz. Photo by Alexis Diaz. 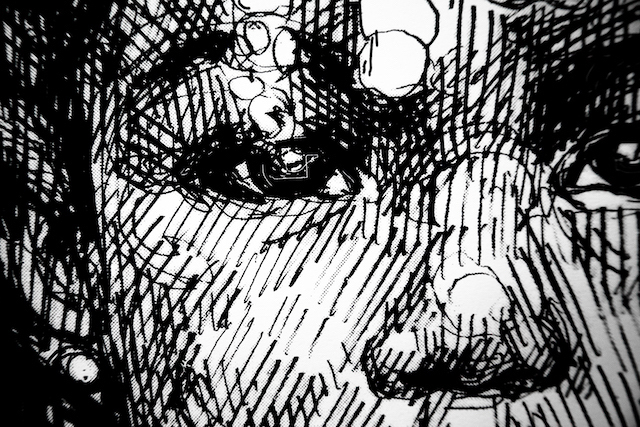 Alexis Diaz (detail). Photo by Alexis Diaz. Amok Island. Photo by Amok Island. GAIA. Photo by Dean Sunshine. GAIA and Ever. Photo by Brendan Hutchens. Lucas Grogan. Photo by Dean Sunshine. Lucas Grogan. Photo by Jean-Pierre Horre. 2501. Photo by Luke Shirlaw. Maya Hayuk. Photo by Jean-Pierre Horre. 2501 vs Maya Hayuk. Photo by 2501. Beastman and Vans the Omega. Photo by Dean Sunshine. HEAVY Projects. Photo by Dean Sunshine. HEAVY Project. Photo by Dean Sunshine. HEAVY Projects. Photo by HEAVY Projects. 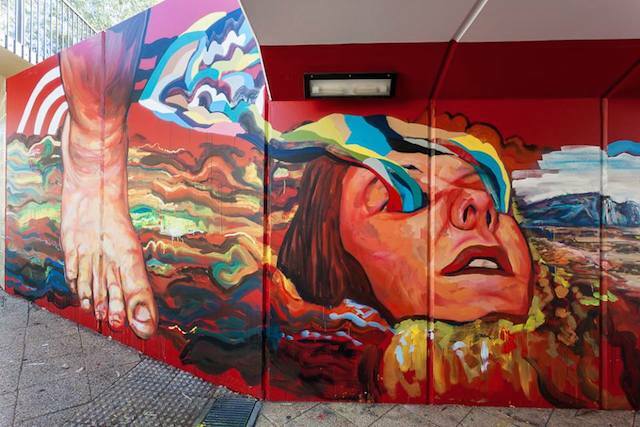 While the event spanned over ~30 days, the main event was the painting of Perth’s 1st ever giant murals over the last 3/4 days of the event. 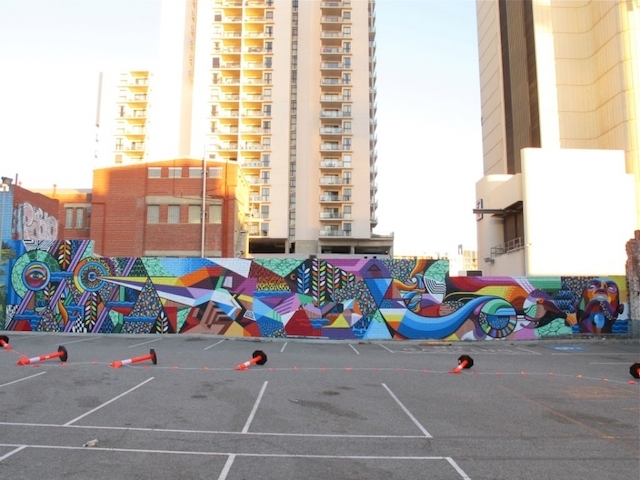 In total there were around 30 murals painted for the event, spanning across the City of Perth. I was very impressed by the organization of the event by the FORM Gallery crew. 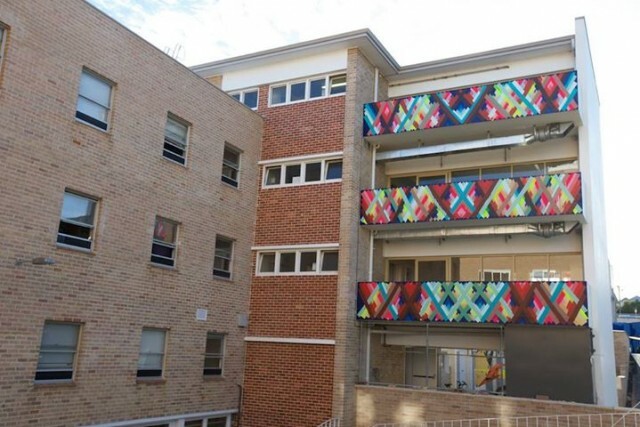 With a logistical nightmare trying to coordinate over 45 artists, paint and equipment, all in 35 degree heat, the FORM Crew did an amazing job, Well done guys!!! A very friendly and hospitable crew. Thanks very much for taking such great care of us while we visited. There was a great selection of artists from ac cross the globe representing all different styles and genres. 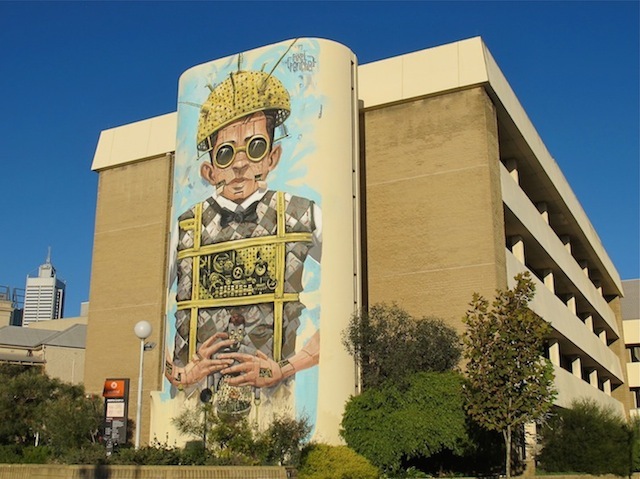 Unfortunately there was no graffiti, but I suppose street art was a big stretch for conservative Perth, so graffiti may have been avoided for this reason. 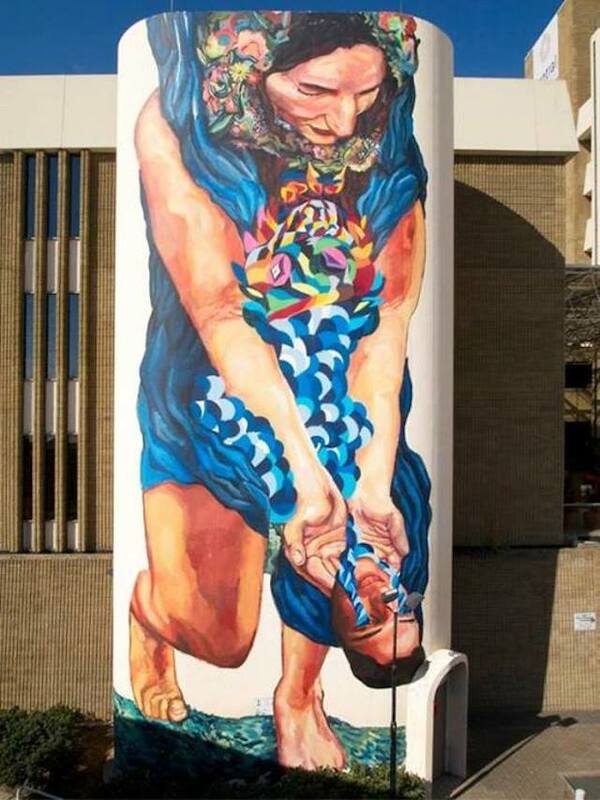 For a city not really known for street art, the public reaction was encouraging. People of all ages and walks of life filled the city over the weekend. I love walking around randomly and listening to some of the conversations and questions people ask each other. In particular I was really impressed by the public’s reactions to the HEAVY PROJECTS installations (interactive works of art that use Augmented Reality on smart phones and tablets). Here’s a short video the guys out together to document the event (plus some footage from a previous project). 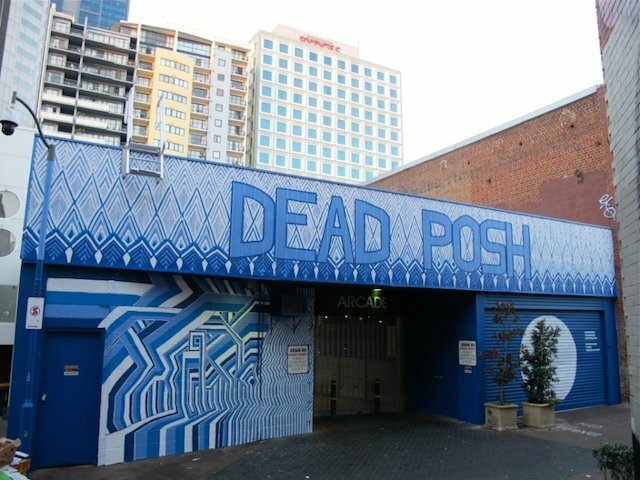 Re+Public: Austin + Perth from The Heavy Projects on Vimeo. On the Friday night there was also a great show at FORM Gallery – PUBLIC SALON showing off canvases from the contributing artists, some great work on display, check out some shots here. And finally. This great video by Chad Peacock is a really accurate representation of the event and well put together. Damn it takes me back!!! 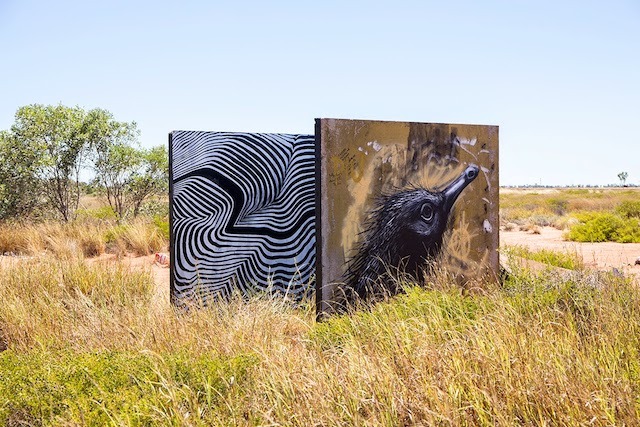 The FORM guys also took a number of artists to visit the Pilbara, a very special part of top end of Australia with breathtaking views and incredible nature (also sadly known for mining – the 2 don’t really go hand in hand). A few of the artists had a paint while there, I particularly like the piece by Remed. Remed. Photo by Ben Fulton-Gillon. 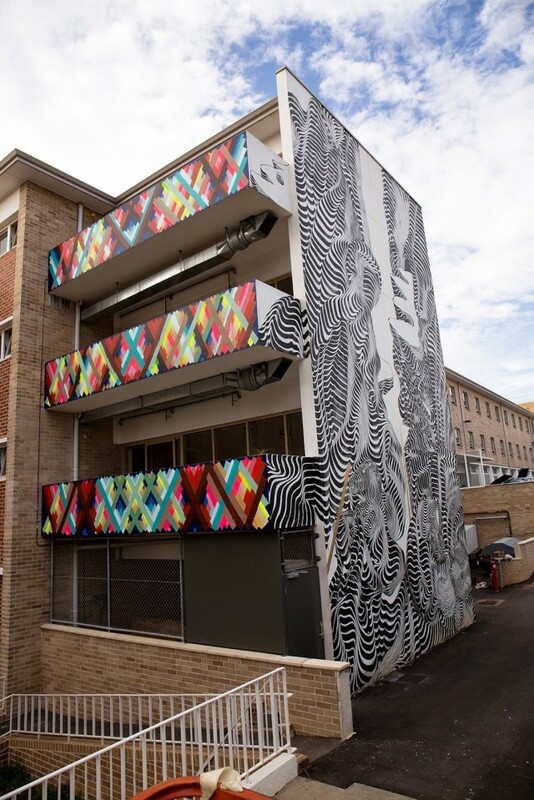 2501 and Remed. Photo by 2501. 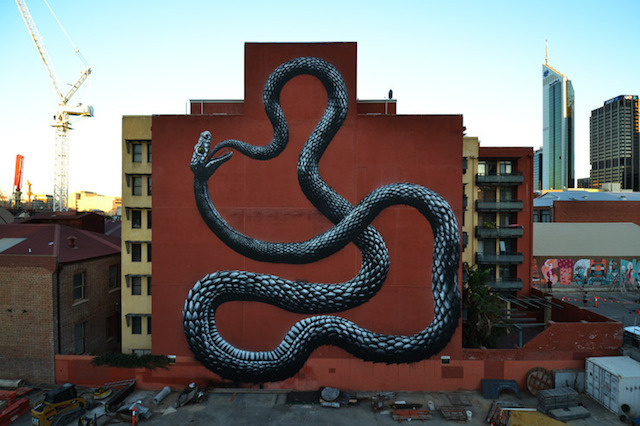 2501 and ROA. Photo by 2501. 2501 and Alexis Diaz. Photo by 2501. 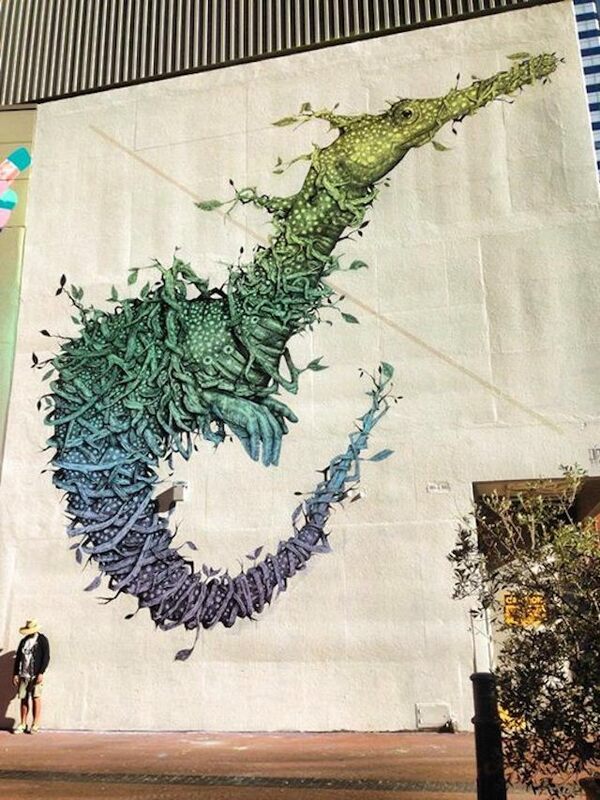 After all of the above, any street art fan in Perth would have to be pretty happy, but it didn’t stop there. 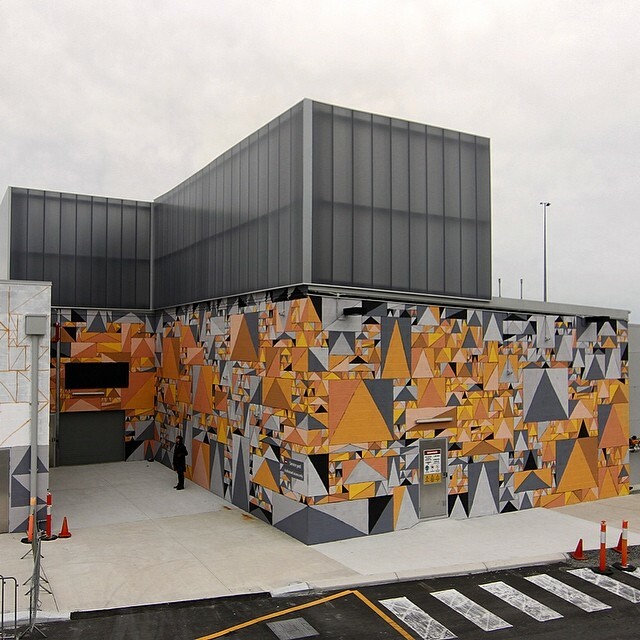 FORM has continued putting up murals in Perth, with Creepy (aka Kyle Hughes-Odgers) painting at Perth Airport (a sponsor of PUBLIC) and also Vans the Omega and Beastman’s new piece that went up last week. 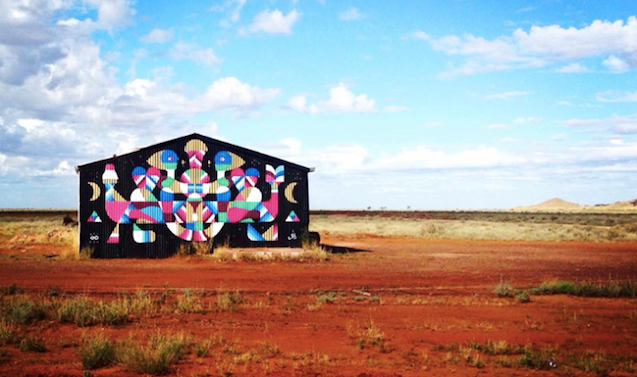 Kyle Hughes-Odgers. 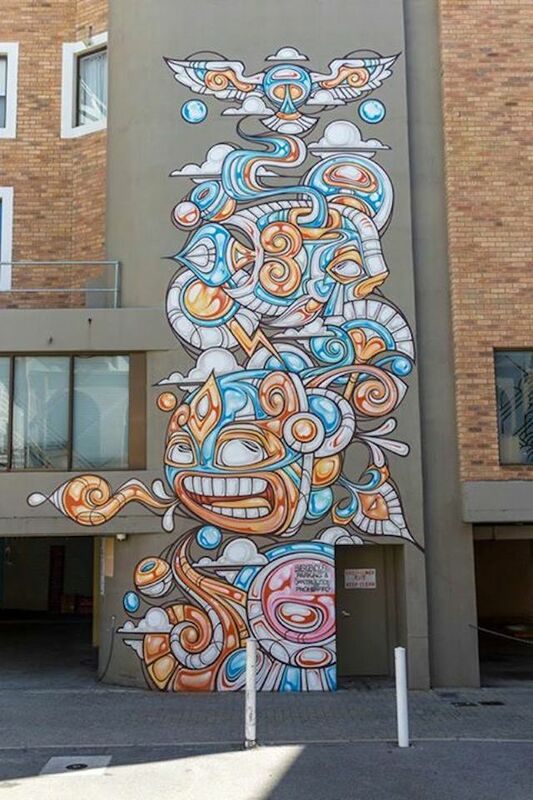 Photo by Kyle Hughes-Odgers. Vans the Omega & Beastman. Photo by Jarrad Seng. Vans the Omega & Beastman (detail). Photo by Jarrad Seng. What I loved most about the event wasn’t just the art, and was not unique to PUBLIC; is the sense of community I felt. 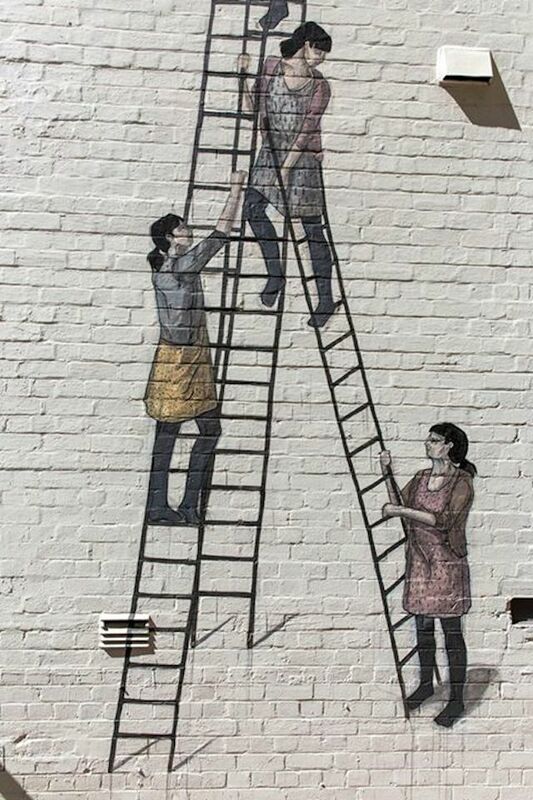 This is something I really love about the street art scene. I got to catch up with some great old friends, and made some new ones who I will undoubtedly randomly catch up with again somewhere around the globe. Fingers crossed that this event is on again next year. I will be there with bells on! 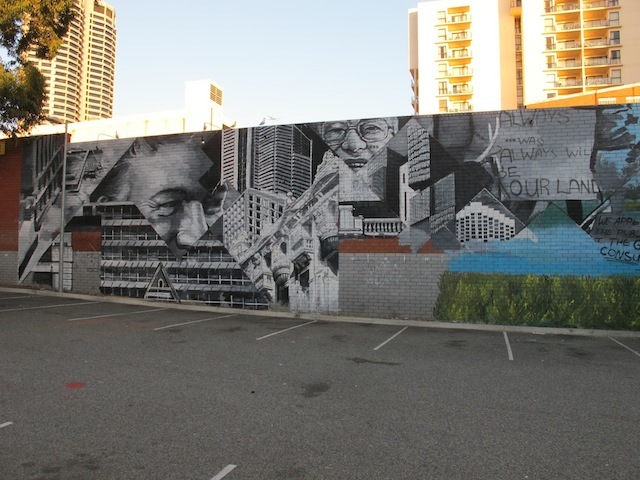 If you are in Perth, check out the full list of artists and the mural map. FORM has also put together this short book called PUBLICation available for Purchase at the Gallery and viewable online for free here. 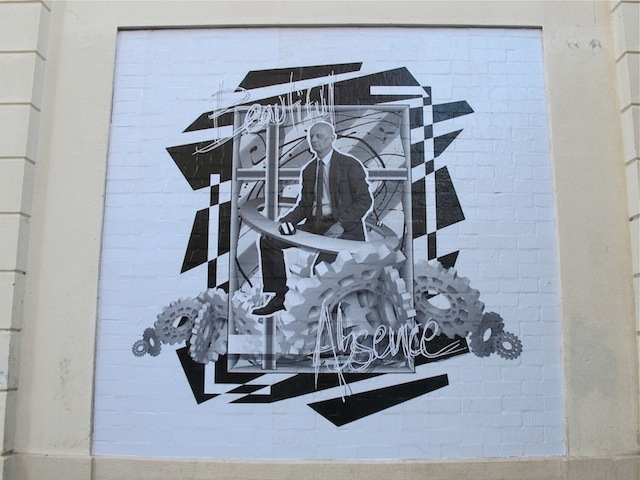 FORM have also started “PUBLIC Urban Art Walks” to give fans a guided tour of the city, well worth checking out. Ok, so that’s enough, right? Actually no, there’s more. And it’s massive. Due to some logistical 😉 issues SANER was unable to make it over for the original dates. I was gutted to hear this when I found out, but when I found out FORM are still bringing him over in August to paint in Perth and also the Pilbara, I was pretty damn excited! I’ll make sure to cover this later in the month. 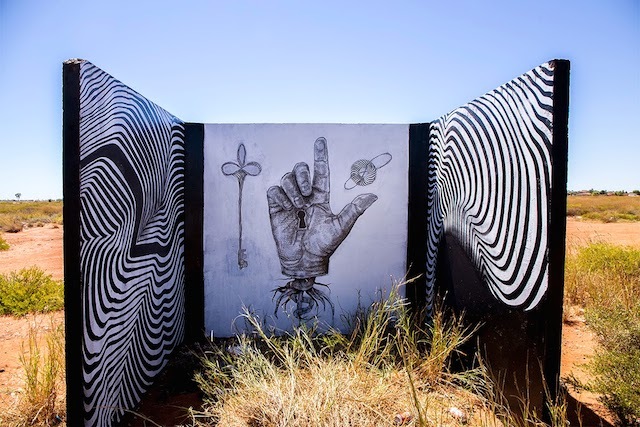 Photos courtesy of: ROA, Dean Sunshine, Bewley Shaylor, FORM, Pixel Pancho, Luke Shirlaw, David Dare Parker, Alexis Diaz, Amok Island, 2501, Ever, Brendan Hutchens, Jean-Pierre Horre, HEAVY Projects, Ben Fulton-Gillon, Kyle Hughes-Odgers, Jarrad Seng.